A House Full of Health: Who Needs Cake When There is Pie!? 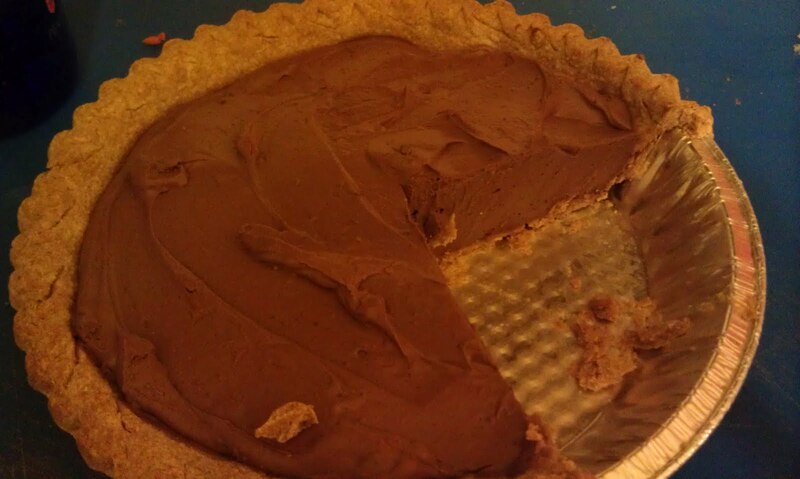 Please welcome back Marsha, blogger of A House Full of Health – who can resist pie indeed! Please read Marsha’s previous post here and follow her on Twitter here, while you’re at it, please do visit her FB page. Enjoy! When I make cornbread I use some silken tofu and some egg replacer. If it’s just egg replacer the cornbread is not as fluffy and creamy. If I just use silken tofu the cornbread just falls apart. So, I use half of each. It works very well! With this, I had practically a whole block of silken tofu left. I looked around the kitchen and found some other ingredients. Here is what I made. Bring a medium sauce pan of water to a boil. Half full or more of water is plenty. Lower to a simmer. Melt the chocolate with the kahlua and vanilla in a metal bowl set on top of the simmering water. Mix frequently with a rubber spatula until melted. Add the tofu, chocolate mixture, and agave nectar to a food processor. Blend until smooth, about 1 minute. Pour the mixture into the pie crust and refrigerate for 1.5 hours or until set. I hope you enjoy this pie as much as we did! So good!! Mmmmmmm! So simple! I’ll take this pie over cake any day ;-)!